With our expertise and resources, we are fully able to accommodate a wide range of iron work requests in San Diego. 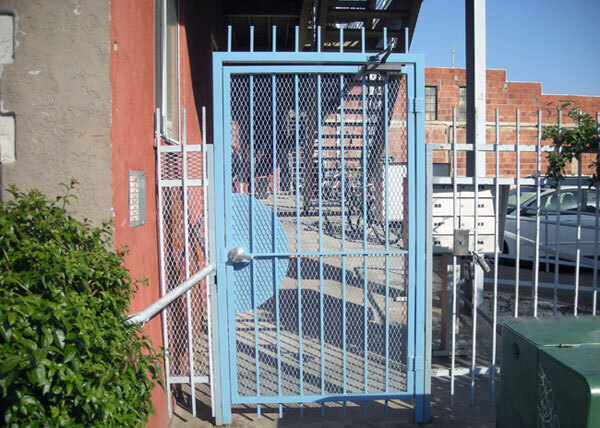 Additionally, we specialize in repairing and replacing old and broken iron railings, fences, gates, and doors in San Diego. We are licensed, bonded, and insured, and our iron work complies fully with all state, county, and city building codes. Call licensed, bonded, and insured B.A. 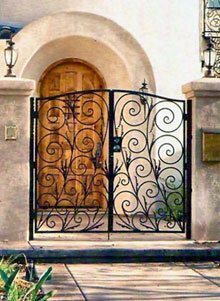 Ramirez & Sons Ornamental Iron Works, Inc. today to install custom wrought or ornamental iron work at your San Diego home or business. We are committed to provided quality craftsmanship at a competitive price with excellent customer service and extensive written warranties. General inquires are welcome, and free on-site consultations are provided anywhere in San Diego. In business since 1980, B.A. Ramirez & Sons Ornamental Iron Works, Inc. has created beautiful, functional, and expertly-crafted iron work for thousands of commercial customers in San Diego County and the San Diego area. Our iron work ranges from fences and gates to railings to window guards and doors, all of which are custom designed for each client's specific needs. Whether you aim to discourage trespassers with iron security fences and window bars or wish to install an automated gate for your driveway with a proximity card reader or keypad, we can help. All of our products feature lasting steel materials, expert craftsmanship, clean finishes, and extensive warranties. We'll work with your budget and ensure that your iron fence, handrail, window guards, or other structure complies with current building codes and ADA standards. Call us today and tell us all about your commercial ironwork needs in San Diego. For over three decades, B.A. 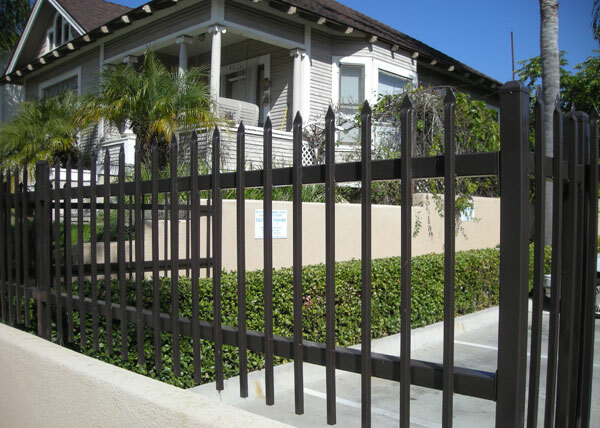 Ramirez & Sons Ornamental Iron Works, Inc. has provided San Diego homeowners and residential communities with beautiful, long lasting, and affordable iron work. Our range of iron work includes ornamental and wrought iron fences, gates, railings, security screens, and window guards, all of which can be skillfully designed to elevate your home's appearance while serving its functional purpose (such as enhanced privacy, safety, security, and/or perimeter definition). We are happy to tailor a design to fit a specific budget, or realize a design that you have sketched or seen elsewhere. Our residential ironwork in San Diego will always conform to current building codes, and we can comply with any applicable HOA CC&R requirements. We stand by our workmanship with written guarantees. Call us today for a free design consultation and online estimate. At B.A. 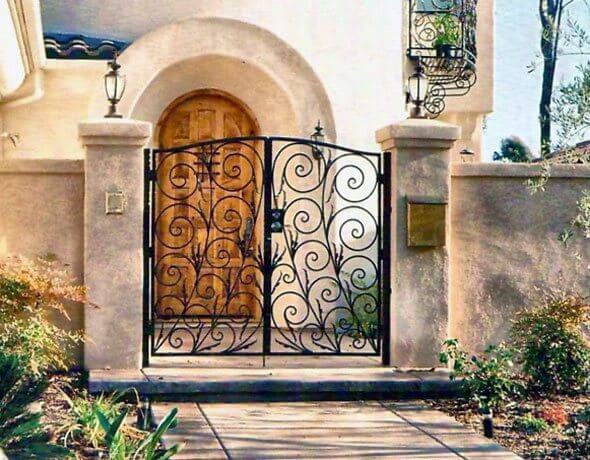 Ramirez & Sons Ornamental Iron Works, Inc., we can design, craft, and install almost any type of iron gate you desire for your San Diego home, commercial property, or residential community. 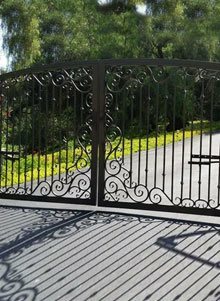 We custom-make wrought iron and ornamental iron access gates, pedestrian gates, security gates, automatic gates, driveway gates, arched gates, garden/side gates and more, ranging from the simple to the highly ornate. These gates are fully customizable, which means that we have the capacity to realize any iron gate design and adapt it to fit nearly any width. 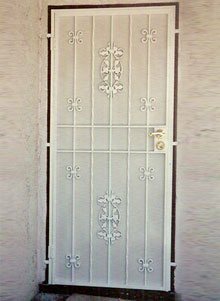 We can also design your gate to slide or swing, and even open automatically. We are qualified to install gate operator and access control systems made by the industry's leading brands: LiftMaster, DoorKing, Elite, All-O-Matic, Linear, RamSet, and more. We'll not only make sure your system is appropriate for your gate and installed correctly, but we'll also ensure you have the proper safety features in place for your gate and application. Gate safety features include photo eye sensors, KNOX emergency access key switches, fire strobe automatic opening devices, and more. 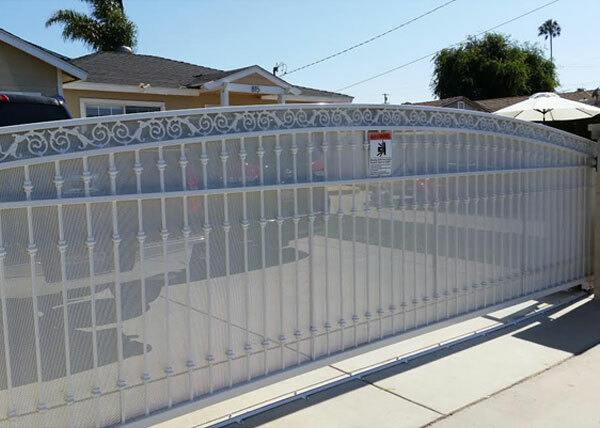 Call us today and we will work with you to ensure your new or replacement gate in San Diego fits your functional needs, complements your decor, and lasts for years. In addition to iron railings, gates, and fences, we B.A. Ramirez & Sons Ornamental Iron Works custom makes iron window guards and doors for our San Diego customers. Featuring heavy duty steel construction and expert craftsmanship, these window guards and doors are made to deter intruders while adding elegant beauty to your San Diego property. San Diego clients can choose ornate scroll work, decorative bars, cast iron designs, one of 100s of powder coat finish colors, and more to design their iron window guards and doors. Window guards are built with code-approved fire releases and doors can feature telephone entry systems, electronic door locks, gorgeous hands, and more. To discuss your iron security window guard and security door installation needs in San Diego, give us a call. B.A. 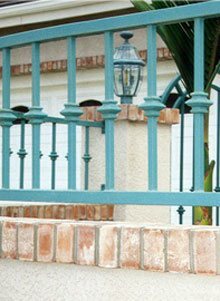 Ramirez & Sons Ornamental Iron Works, Inc. offers an endless array of options for your San Diego commercial or residential railing needs. 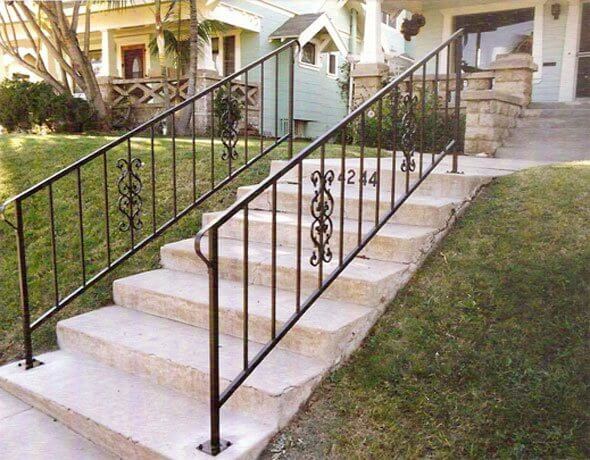 Every railing, handrail, and guardrail is custom designed and made to client specifications. 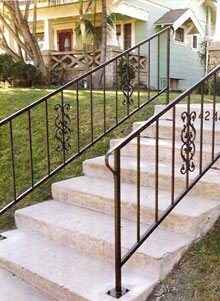 We can make everything from a simple, ADA-approved handrail to a highly ornate railing that features elaborate scrollwork or elegant balusters with baskets or knuckles. Additional design options include crown caps, wooden top rails, powder coat finishes, and galvanized, metallized, or powder coat finishes for anti-rust protection. With our expertise, you can trust that you'll get a lasting, gorgeous railing no matter the application, whether it is for a steep incline, an exterior balcony, or an interior spiral staircase. 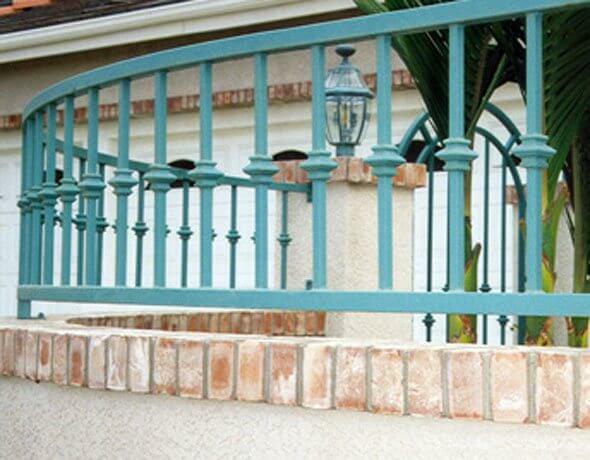 Call us today when you want to find the perfect iron railing for your San Diego property at a competitive price. At B.A. Ramirez & Sons Ornamental Iron Works, Inc., we can create almost any style of iron fence, from a high-security iron fence made of heavy-duty steel pickets to a custom-designed perimeter iron fence made of ornamental iron and integrated cast iron design elements, for San Diego residential or commercial properties. Our residential property fences are typically made to enclose front yards and backyards, but can also be used for pet enclosures, gardens, and pool areas. Additionally, we have a proven track record of meeting the fencing needs of commercial and industrial clients, who come to us for security fences, automated gates, perimeter fencing, and code-compliant fencing. Call us today for a free design consultation and online estimate. Call B.A. 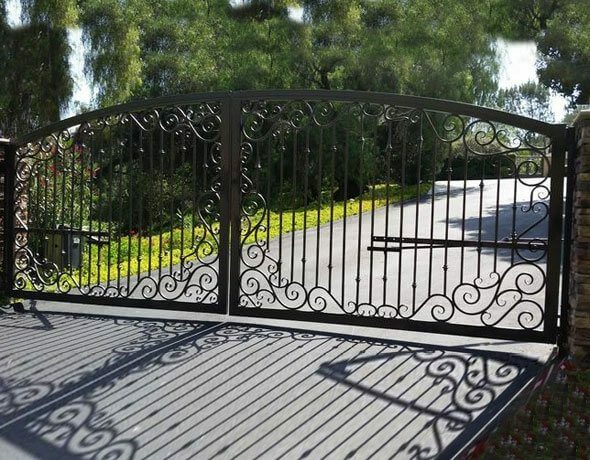 Ramirez & Sons Ornamental Iron Works, Inc. today and join thousands of satisfied San Diego customers (including many in San Diego) who have received exceptional iron work at an affordable price. Our iron fence, gate, railing, window guard, and door installation services meet the highest of industry standards and are backed by extensive warranties. Throughout your project, we'll work closely with you to ensure that the end product reflects your needs and vision, and complete all work in a timely manner. To learn more, schedule a consultation today. F2 This commercial steel fence was installed in San Diego, CA. BA Ramirez & Sons installed this Apache style fence in a commercial parking area. The fence features 1 ½" horizontals with &frac58;" pointed pickets. G33 At the entrance to a downtown San Diego apartment complex, this style of gate is built for maximum security. Built with a 2" sq. tube jamb, the 1.5" steel tube framed gate has expanded metal backing for lock security. DW9 In South San Diego, CA, B.A. 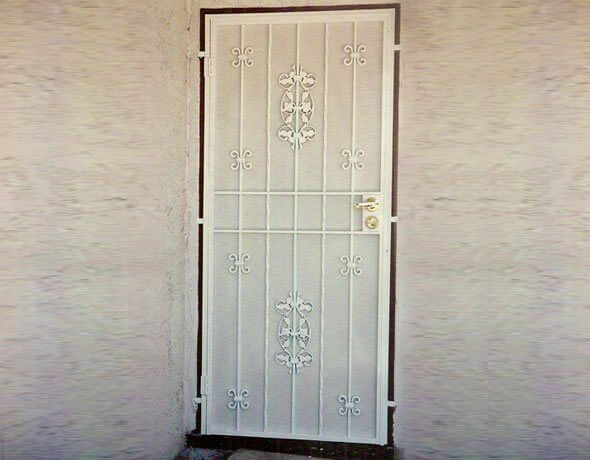 Ramirez & Sons installed this residential automated gate with custom aluminum scrolls and decorative knuckles. This arched automated gate has perforated metal backing for added privacy.